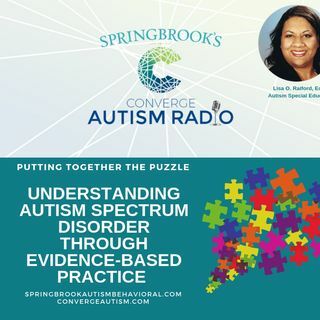 Join host Melanie Vann and guest Lisa Raiford as they discuss Springbrook's Converge Autism Summit and her presentation on Putting Together the Puzzle: Understanding Autism Spectrum Disorder through Evidence-Based Practice. Lisa O. Raiford, Ed.D. began teaching as a special education teacher, certified in Emotional Disabilities. Her experience in working with individuals with Emotional Disabilities and Autism Spectrum Disorder lead her to earn her National Board Certification as an ... See More Exceptional Needs Specialist. Serving as a District Teacher of the Year, and a South Carolina State Finalist Teacher of the Year, Dr. Raiford has worked to restructure an alternative school and serve as a Consultant in the area of Emotional Disabilities and Behavior for a large school district. Currently serving as the South Carolina Department of Education Consultant for Autism Spectrum Disorders, she has worked to provide education, awareness, and programming for individuals with Autism and their educators, including the development of a statewide Task Force on Autism Spectrum Disorder, and the ASD Virtual Library, a collection of resources for educators, parents, and students. Dr. Raiford also provides educational workshops for youth programs in the community that embrace the inclusion of youth with disabilities in their programming.